The octagonal badge of MG is hard not to recognise, in fact, since its establishment in the 1920s, this historic British sports car manufacturer has become one of the most iconic around. Best known for its two-seat open sports car, MG has designed and engineered a range of models over the years, but what if the grille of your MG becomes damaged? The MG TF is one of the car brand’s most well-known convertibles. Produced between 1995 and 2005 and again from 2007 to 2011, the MG TF (previously referred to as MG F) is now a common sight on UK roads, with its grille forming a vital part of this particular vehicle’s exterior appearance. 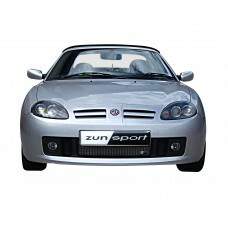 Our MG TF full grille sets are available from just £105.09 with a standard finish and £115.97 with a black finish, and with a fitting time of just 45 minutes you can restore your sports car back to its former glory and continue to protect the heat exchangers and brake areas within.